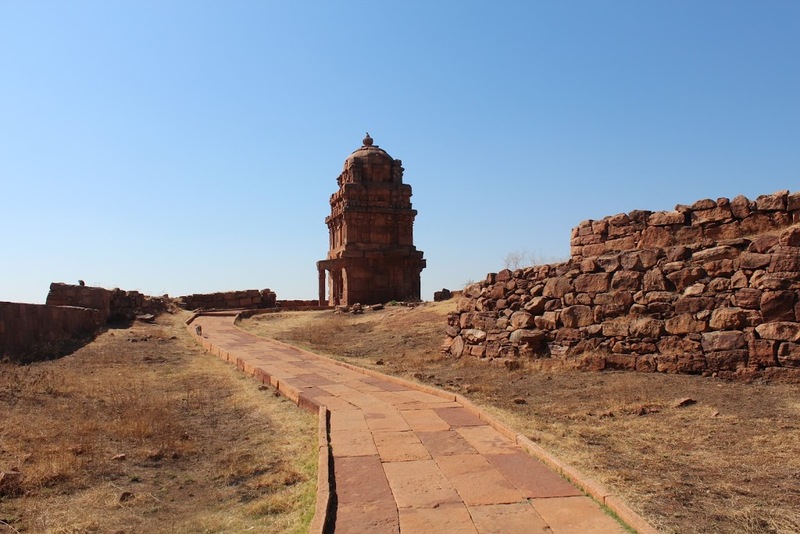 Trip to the Chalukyan Era – III – Badami Fort – Holding fort the Chalukyan pride ! | Highway - the only way ! 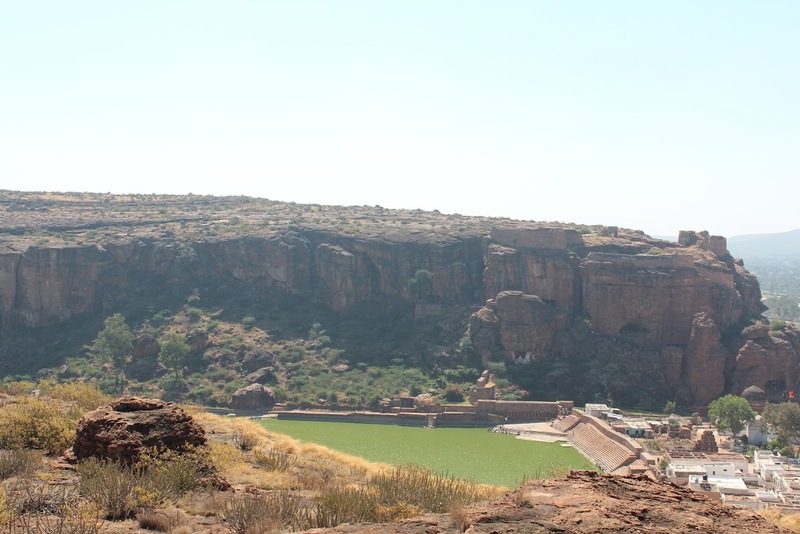 Trip to the Chalukyan Era – III – Badami Fort – Holding fort the Chalukyan pride ! Did you know that the great Emperor Harsha’s only military defeat was in the hands of Pulakesin II, the Chalukyan king? Or that Pulakesin’s only defeat, in turn, was in the hands of the Pallava king Narasimhavarman? Few would know, very few would bother, what would you gain by knowing 1400 year old history? We do not have an answer for that because it is not about gaining anything, it is about respecting those great men of ancient times who were instrumental in building our present, the present we are so keen about. Who were the Chalukyas, whose temples we celebrate, today, as World Heritage monuments? They make a very brief appearance in school history books, they talk about Chalukyan art and architecture with just a passing mention of their great kings, as a result many have only heard of the Chalukyas or just have no idea who they are. 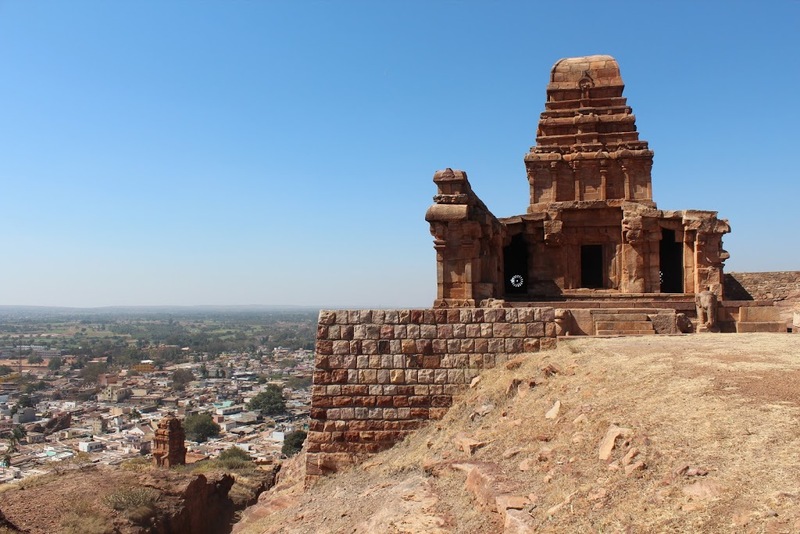 Here is their story, in short, before we visit the Badami Fort. Until the mid 500s A.D, South Central India was ruled by several small kingdoms, when Pulakesin I, the son of a chieftain of one such small kingdom, rose to power, unified a major part of the Deccan and established the Chalukyan Dynasty. 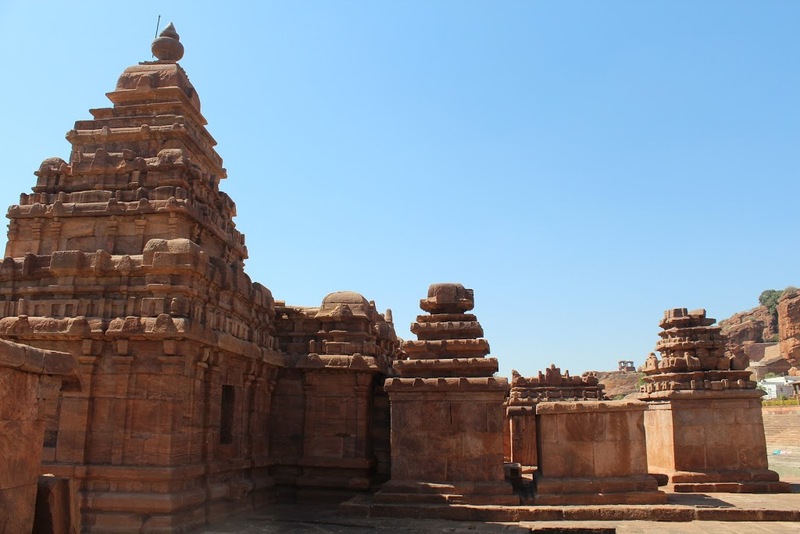 They had their first capital at Aihole, 40 kms from modern day Badami, Pulakesin I, decided Vatapi (Badami) was strategically better located with natural protection and made Vatapi his capital. For the next 200 years, they rocked South India as one of the most powerful dynasties. 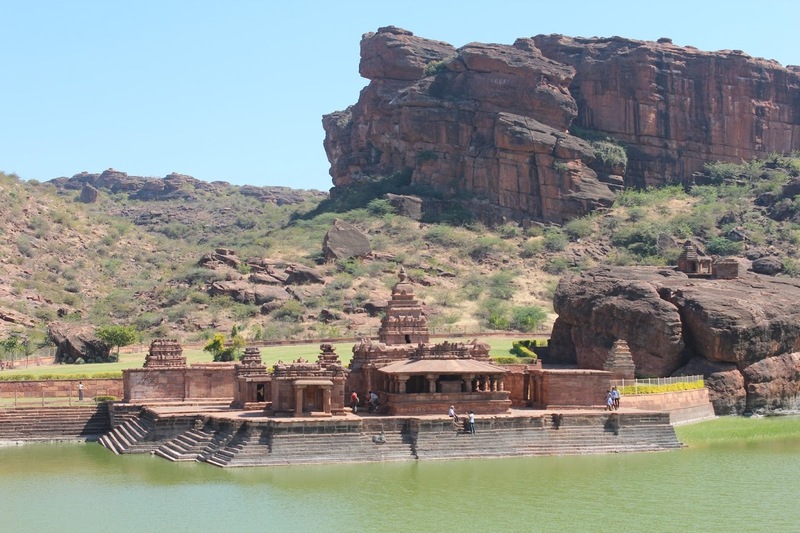 Pulakesin I was succeeded by Kirtivarman I, who is credited with the Badami Cave temples. He remained the most powerful king of his times, until Mahendravarman’s son Narasimhavarman ended his victory march and avenged his father’s defeat, destroying Vatapi in the process, it marked the end of a golden era. 13 years later, Pulakesin’s son defeated the Pallavas again and recaptured Vatapi, the enmity between the Chalukyas and the Pallavas was passed on as hierarchy with each succeeding king fighting wars with their Pallava counterparts. This went on until 753 A.D, when the Chalukyas were finally overthrown by a new dynasty, the Rashtrakutas. After this, there were other smaller dynasties of the Chalukyas that ruled parts of Karnataka and Andhra till the 12th Century A.D. The Chalukyan rule, art and architecture is now legendary and was probably a reference book for later dynasties and probably in our times too. Boring history? Really? You could make a blockbuster movie out of their history ! Read Kalki’s immortal Tamil historical novel, Sivakamiyin Sapatham (Sivakami’s Vow), which is based on the war between Pulakesi and Mahendravarman and Narasimhavarman’s revenge, you will know what we mean ! With that, we continue our trip. After visiting the Cave temples, our first stop was at the Archeological Museum. The shortest way to reach the museum is by walking the 500 meters from the caves around the Agatsya Lake. 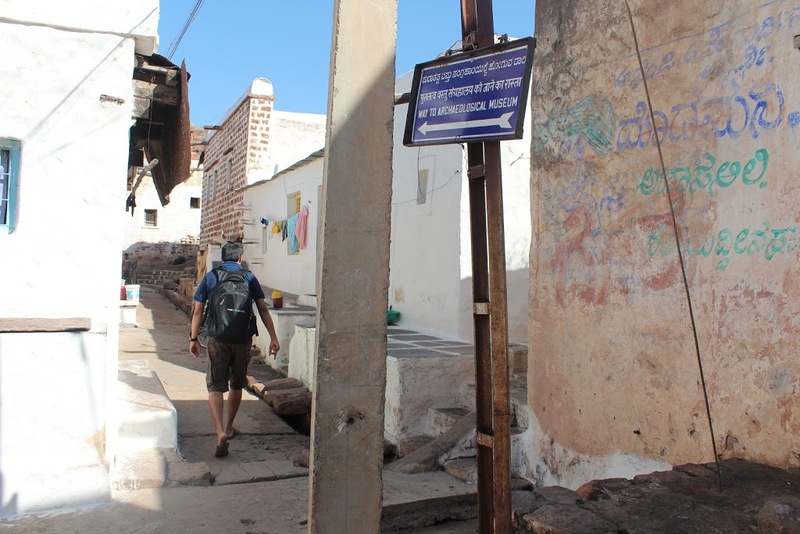 Those 500 meters walk takes you through the narrow, dirty, bylanes of Badami, showcasing how badly the fort and its settlements have been encroached upon. In those lanes, bordered by open drains, pigs out number people. It is appalling that ASI has not found a better way to reach the museum and further up to the fort ! You will be willing to forgive that, once you enter the museum. The museum is located at the foot of the fort. The museum has artifacts and sculpture excavated from various parts of the Chalukyan dynasty. 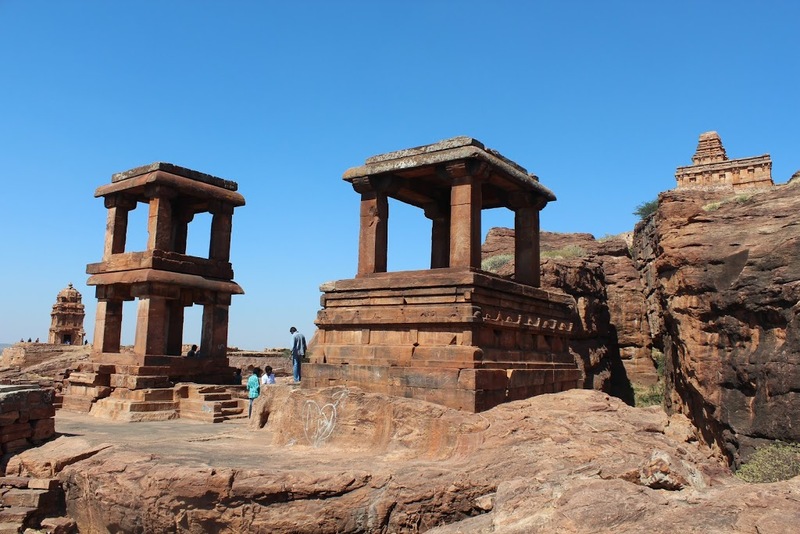 There is also a section which has some very interesting information about pre-historic rock settlements and paintings on the hills surrounding Badami. 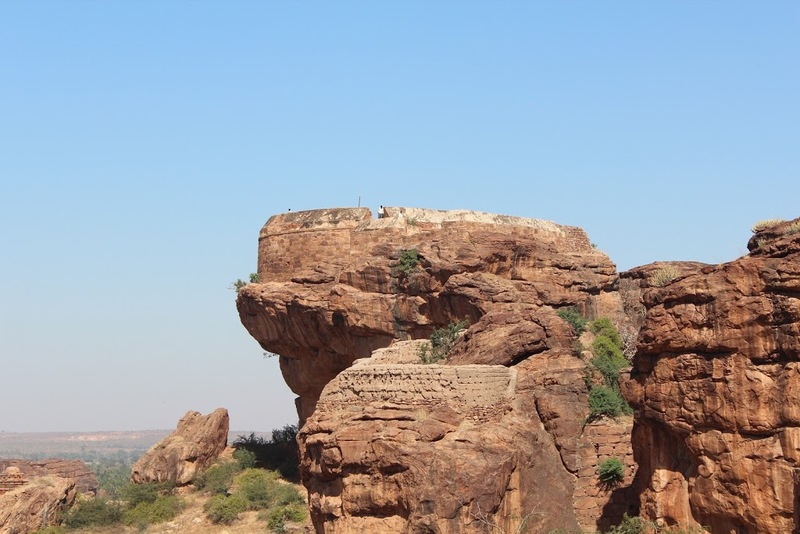 Silaphahadi Cave, a short distance from Badami houses on of these rock shelters, we were told, it could be reached by a 3 kms trek on the hill, we were definitely tempted to explore it but were short of time. Museum over, we climbed up to the fort. 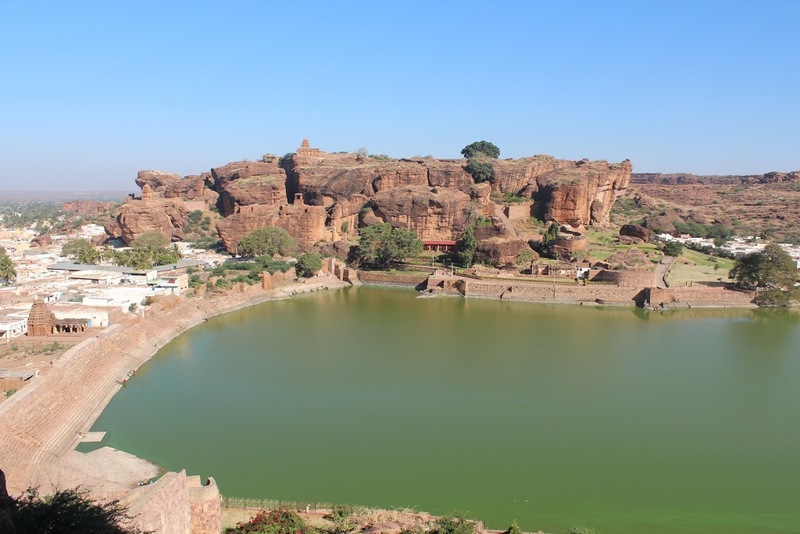 Badami fort is built on the rocky hill on the other bank of the Agatsya Lake, the structures are built between gigantic rocks and ravines which act as natural walls and moats. For example, the main entrance to the fort has these two imposing rocks for walls and they just had to build an arch at the entrance ! Monkey alert: There are a lot of monkeys on the fort, they do not disturb you unless you are carrying “monkey friendly” items. A few steps lead up to the fort complex, the climb is not very difficult. What was once the seat of the Chalukyan pride, is now an almost empty piece of land. A few structures, such as this temple have remained adamant over the years, though ! 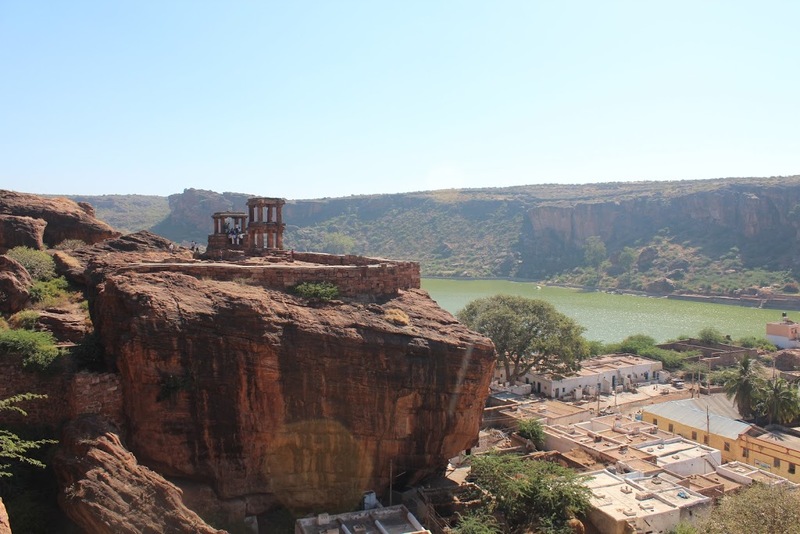 The Chalukyas seem to have a liking for rock climbing and adventure, look where they built their mandapas ! Check out this precariously located watch tower ! 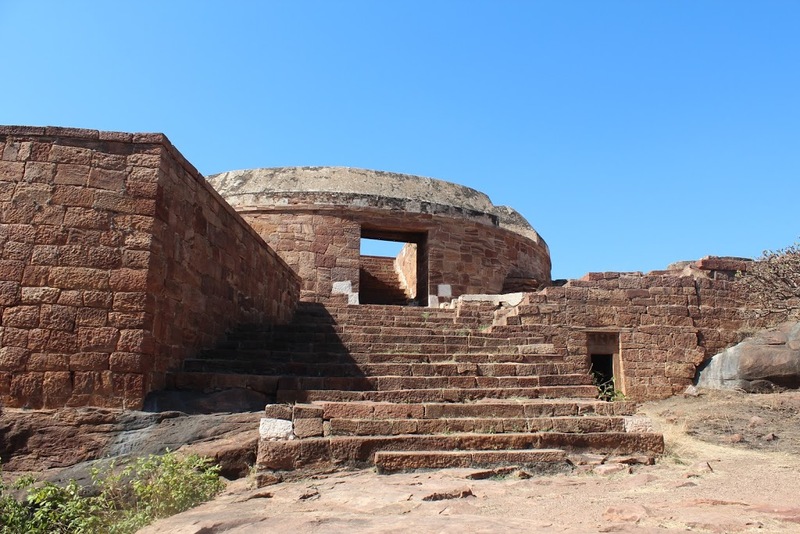 You can climb to the watch tower, ASI has built steps so that you don’t have be as adventurous as the Chalukyas ! 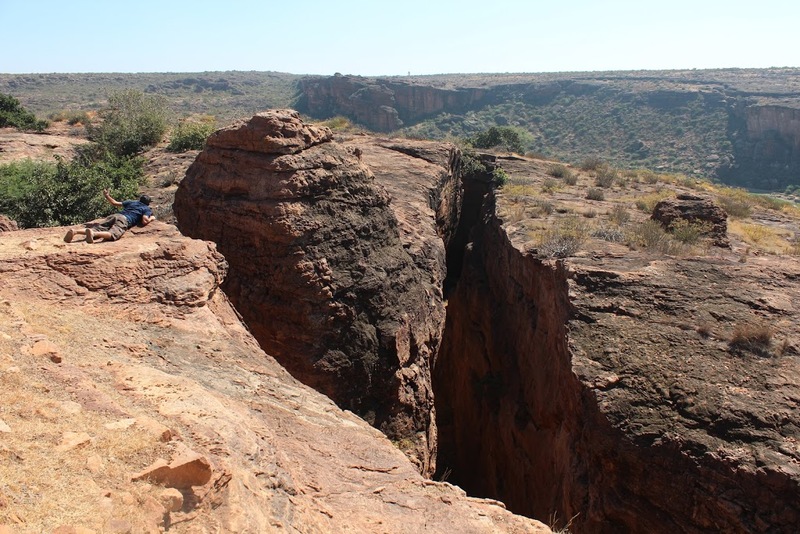 You can get a bird’s eye view of Badami from here. The maintenance of the fort is surprisingly good, ASI has built a pathway to walk around the fort. Further down from the watch tower, there are two structures, they must have been granaries. You could imagine soldiers drawing food supplies from here. As we walked around the empty space, we imagined the great Pulakesi holding court and drawing up battle strategies, Narasimhavarman destroying the fort in his revengeful rage. Cutting back to reality, today, most of the fort is vacant space with a few ponds here and there. A few yards down, the open space abruptly ends in a deep, dangerous looking ravine. Standing at the edge and looking down was terribly scary, it felt like we would slip any moment, we found it safer to lie down and look into the steep fall. On the edge of this cliff, stands another ancient temple, simple and elegant, its walls are part of the cliff-edge. How did these people manage to build structures on the edge of cliffs? Literally, cliffhangers ! The spoked wheel like design you see in the picture is actually a creative idea meant for ventilation. From here, you can see the cave temples on the opposite hill. In the silence of the fort, you can hear people’s voices all the way from there. 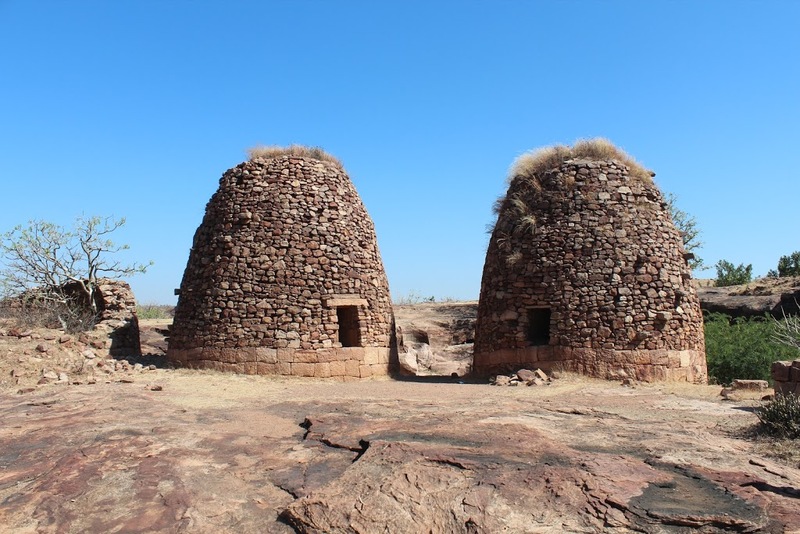 There is also a masjid like structure at the centre of the fort, must have been a later addition during the Muslim rule, several centuries after the Chalukyas. All around was quiet and still except for the cool hill breeze, it was so serene, you could simply sit down and meditate. None of us seemed to want to go from there, it felt like some ancient charm was holding us back. But, the real world calls and we made our way down. On the way back, we found a path leading to the mandapas we saw at the start of the fort tour. 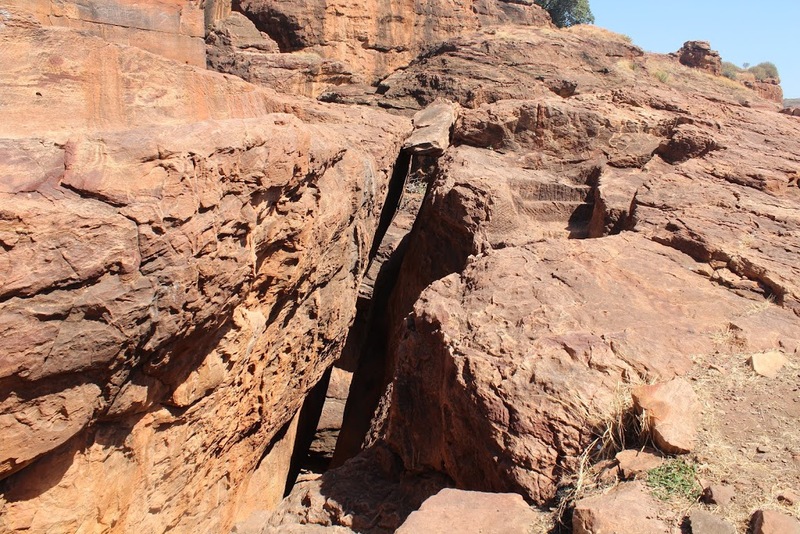 One has to squeeze through a narrow opening between two rocks, with another rock almost dangling overhead ! No worries, the rock has held its ground from time immemorial (though while trying to step on the rock, this writer’s heart almost leapt to the mouth) ! This must have been a vantage watch point or a rest area where soldiers could sit and enjoy the sunrise and sunset (did the poor soldiers have such luxuries?). With one last picture of all four important remaining structures on the fort, we climbed down. 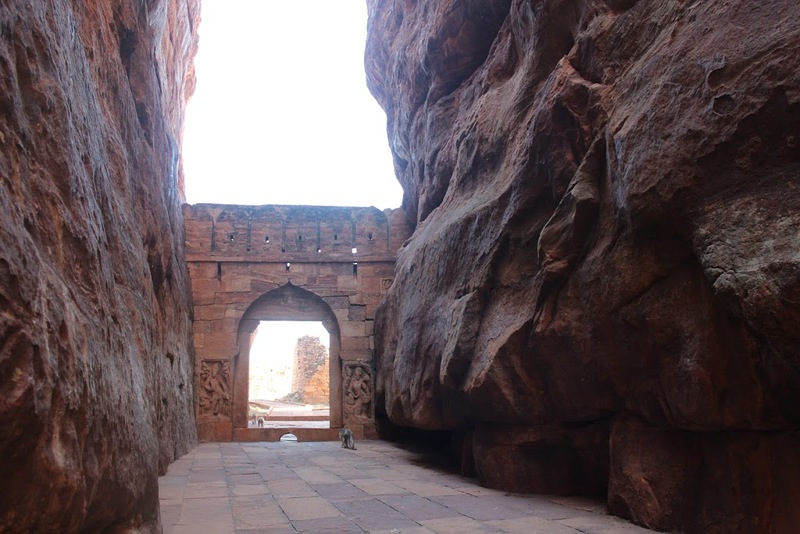 If you asked common people at Badami, they would tell you that Badami fort “has nothing”, they could be right, there are no big structures, nothing concrete but the Chalukyan glory, their might and valour resounds everywhere even in the dry, empty space of the fort, you can feel it in the air. The Chalukyan pride is intact, their once impregnable fort, continues to hold fort their pride ! Back from the fort, it was close to lunch time and quite hot. 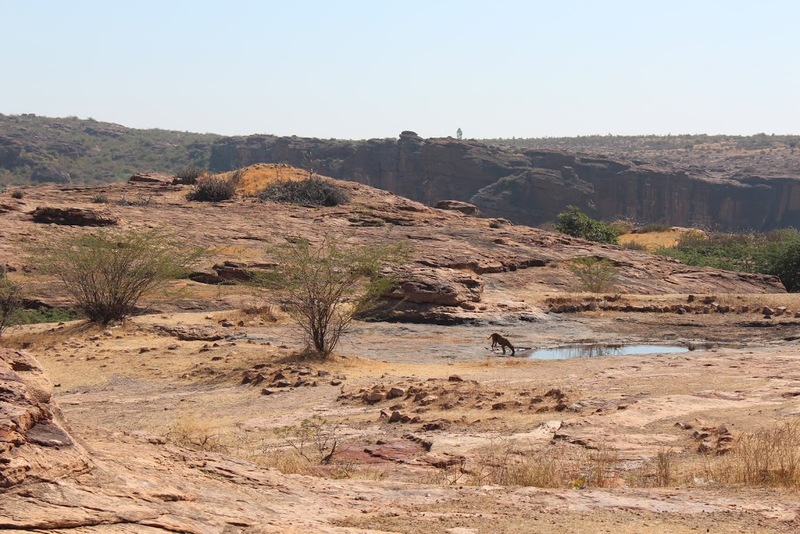 Badami is a very hot, dry place, you can’t think of visiting this part of the country in Summer. We refreshed ourselves with 2 glasses of the best sugarcane juice we ever had and walked further around the Agatsya Theertham to the Bhootanatha temple on the edge of the lake. We passed by a few Jain temples on the bank and were followed by kids who wanted us to take their pictures and kept pestering us with their “Hello”. 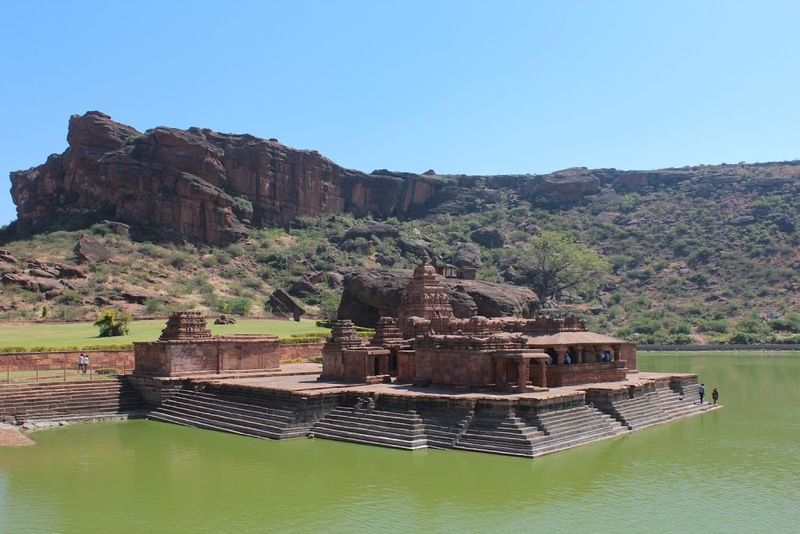 Being a popular tourist site, Badami attracts foreign tourists and the kids must be used to the foreigners taking pictures and giving them some money. The Bhootanatha temple is a very “cute” temple. It is almost in the lake, during heavy rains, its steps are submerged under water. 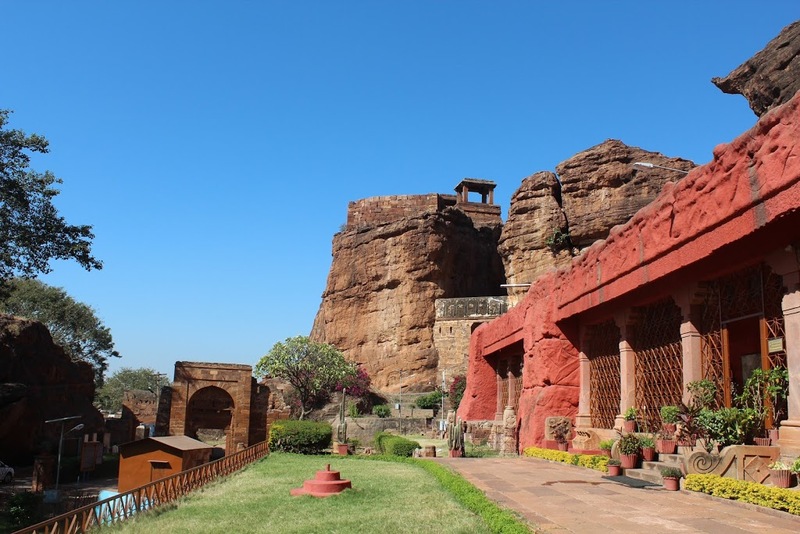 It has the most picturesque location for a temple, on the banks of a lake surrounded by hills, with sculptural marvels of cave temples on one side and a mighty fort on the other. We couldn’t get a panaromic view but loved this “side profile” of the temple ! Bhootanatha Temple is dedicated to Lord Shiva. The complex has a group of small temples built during various phases of the Chalukyan era. The main temple structure is very similar to the Shore Temple at Mahabalipuram belonging to the Pallavas. Who copied whom, we do not know ! Winding up our visit, we walked along the path that goes right behind the temple, around the lake, all the way back to the road. On the hills, there are some modern day POP models depicting scenes from the Chalukyan times, these modern statues are not a speck on the ancient sculpture we had seen the entire morning but still one has to appreciate the effort in trying to reconstruct the village life 1400 years ago. Our camera was on the verge of switching off and it had been overworked but every time we closed it, another beauty would crop up and we couldn’t resist taking pictures, Badami had cast its spell on us. Tired and hungry we sat down for lunch at Hotel Banashree. While a foreigner at the table next to us ate a Masala Dosa a la Subway style, we slurped and wiped the Thali off our plates. 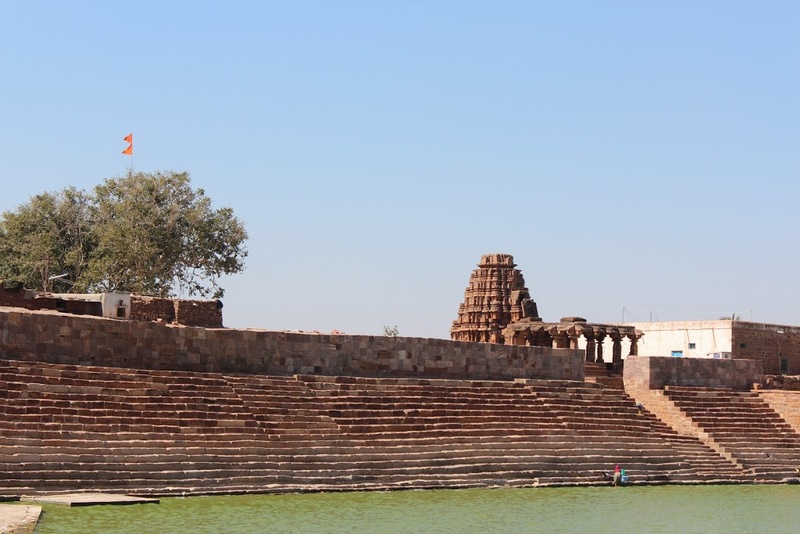 After 5 hours non-stop sight-seeing, walking and a heavy meal, we went back to our hotel for a 2 hour break, promising ourselves we wouldn’t doze off and be ready by 3 PM for our next destination – Pattadakal. thank you my dear brothers and sisters who had done a wonderful trip and capture the images. i am very interested in history and used to read lot of history novels. just now completed Sivagamiyin sabatham ( i dont know how many times) and searching web to know about Vadaapi. you have given very very useful knowledge about the place. hats off to you and the creator of the place. Thank you so much for the wonderful comment ! We are also big time history lovers. Our main writer is currently reading Sivagamiyin Sabatham, Ponniyin Selvan is another favourite. You can see all the history coming alive in these forts.